Several years ago, I was a research assistant for a professor of American political economic history who was working on a manuscript about the 1896 Democratic National Convention. My job was to retouch a number of cartoons that appeared in newspapers at the time; scanned from microfilm, the images were dirty and inky, and so I had to clean them up by removing errant pixels -- and sometimes fill in the blanks. The scanning sometimes failed to pick up the outline of an important face; at other times, the professor wanted me to highlight parts of the cartoon that might otherwise have been obscured: that is, I sometimes had to exaggerate a face, or a building, or the presence of a bag of silver coins (it was an interesting moment in American monetary history, with myriad debates about whether gold, silver, or greenbacks should be the national currency. Fascinating stuff! Erm. Anyway....). Long story short: lots of photoshopping. The ethical questions of image manipulation in an ostensibly scholarly, historical text aside (that would require its own full week of rumination and blogging), working with photoshop for a year and a half made me a little pixel-crazy. I'd dream about using the photoshop eraser function on people. Seriously: everything started to feel like it could be reduced to -- and reconfigured by -- its constitutive pixels. I started to see everything as a possible jpeg file. It was weird. Reportedly taken on Whidbey Island (in Puget Sound, north of Seattle) and Bryce Canyon in Utah, I seriously thought that these photos were taken of perfectly reasonable, nice human beings standing in front of gigantic backdrops of those locations. Seriously. Look at them. I mean, I had received an email from my father shortly after he, my mother, and various aunts, uncles, and cousins had gone on this slightly oddball trip to Utah (if you know my family, you know that we do not travel well together, and not in a quirky Little Miss Sunshine sort of way); in his message, my father said something that set off various alarms, and which prompted the presumption of photo manipulation: We went on a hike. Er. Right. The mental image of my mother hiking is nearly as ludicrous as this "actual" image of her standing near the edge of the canyon that she reportedly hiked into. There's something about the way the flash is hitting her face, and the weird flatness of the canyons behind her, that scream Gift Shop to me. And as for AH, posing serenely somewhere on Whidbey Island -- the thing is, I know that he and MD actually went there. Or at least they say they did. There's a whole set of photos from the wedding they went to. And yet ... doesn't he look like he's about 100 miles away from whatever that lake/mountain scene is? Like maybe it's a bluescreen? 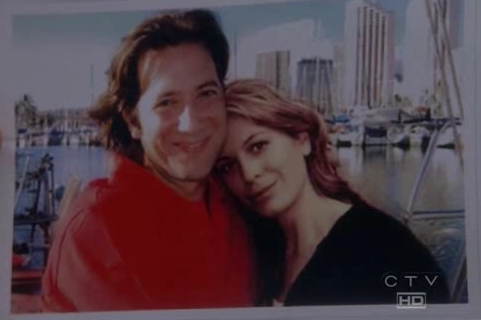 [I am reminded, sort of stupidly, of Lost, specifically of that photograph of Desmond and Penny, where for an entire season we're led to believe that they were at some marina or harbor, when in fact the photo was taken in London, in front of a photographer's backdrop, and then we find out that it's taken moments before Desmond breaks up with Penny, and so the photo has poignancy beyond its locational fakery, and christ, anyway.....] There's also this photo on the right here, of our intrepid co-blogger, also presumably somewhere in the Puget Sound region. See what I mean? 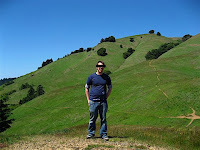 In this photo, it looks less like he's standing in front of a backdrop, but rather actually photoshopped into a real landscape. If not for the slight shadow to his left (indicating... just past noon? ), I wouldn't have believed that our friend had actually left the comforting environs of his metropolis. I have no understanding of the technical explanations for why photos that aren't actually photoshopped end up looking like they were. [You can read here to learn how to check for actually photoshopped images.] But I am fascinated by this cultural moment in which, thanks to "advances in technology," we tend to assume that any photo we see has most likely been retouched one way or another. This has partly to do with our nearly hysterical interest in celebrity and its attendant proliferation of image as icon as image ad infinitum, but is related more to what I'm going to assume is a general malaise and/or beleaguered cynicism about what constitutes "the truth" these days. [It's not for nothing that Truthiness has so much currency.] We've become a society of doubters. The photos and images on probably awkward (both original and swiped) have occasionally been edited for cropping, lighting, and white balance. And the sometimes-necessary black bar over the eyes, to protect the innocent. But nothing else. I'd like to think that the intersection -- the dialectic, if you will* -- between text and image in probably awkward produces an effect whereby one medium illustrates the other, and that that interplay privileges neither text nor image. The images here are as important, as thought out, as the text, and in that sense we feel no compulsion to perform any funny/funky manipulation of the images; they should speak for themselves. We don't present photoshopped images without calling attention to their photoshoppedness. It's our job here to do the doubting (we've got skepticism in spades!) -- but in that doubting, we're also trying to get closer to something more honest, more aware. I don't know what it means then, when the devices we rely on to accurately capture our experiences begin to make those memories of real events appear constructed or false. I mean, it's good to question things; but sometimes it'd be nice to you know, not have to. My mother insists that she went on that hike, and that she got mild heat stroke from it. It's a sorry state of affairs that even with that photograph as evidence, I'll probably never believe her. Oh, Photoshop: ruining family relations one image at a time. I think both vacation photos look fake because of partly cloudiness. Large parts of the backgrounds are illuminated differently than the subject in the foreground. Also, the shallow depth of field and the lack of any objects in the middle ground makes the two (bkgrd and fgrd) diverge visually. Carry on.